Yard, Contractors Report $140 Million In Business A dozen years ago, the Port of Portland (Oregon) and its tri-county citizens gambled that an $84-million shipyard expansion program— including giant Drydock 4, which was specifically designed to serve the VLCCs in the Alaskan trade— would keep Portland a competitive ship repair center into the next century. Now, after more than 300 dockings on Drydock 4, Portland's ship repair expansion can be declared a major success. "There appears to be two reasons for our growth . ..," said Guy Alvis, Portland Ship Repair (PSRY) manager. "First, Drydock 4 and the Portland Ship Repair Yard's second- to-none facilities appear to be the 'better mousetrap' that is attracting more and more repair business to Portland. "Credit should also be given to Portland's quality labor force and the aggressive ship repair contractors at the yard." PSRY reports that 70 percent of its work lies in the tanker sector, 5 to 10 percent in cruise ship sector, and 25 percent in the military. West State, Inc., one of the contractors in PSRY, recently docked the 987-foot Exxon Long Beach, the 300th ship to go up on the blocks at Drydock 4. The ship is being overhauled under a $5.5-million contract. Since it went into service in March 1979, Drydock 4 has been responsible for the creation of 750 jobs per year and earned an estimated $500 million. Other important additions during the $84-million expansion include: a 3,000-foot-long pier and outfitting berth on the river side of the shipyard; a battery of heavy-lift cranes that serve Drydock 4; and a ballast water treatment plant for handling the oily wastes off ships that come into the yard. 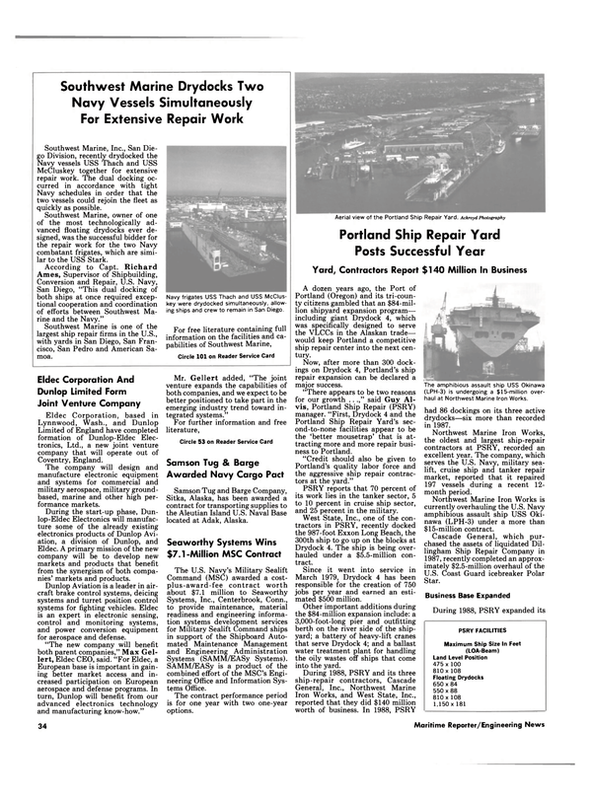 During 1988, PSRY and its three ship-repair contractors, Cascade General, Inc., Northwest Marine Iron Works, and West State, Inc., reported that they did $140 million worth of business. In 1988, PSRY had 86 dockings on its three active drydocks—six more than recorded in 1987. Northwest Marine Iron Works, the oldest and largest ship-repair contractors at PSRY, recorded an excellent year. The company, which serves the U.S. Navy, military sealift, cruise ship and tanker repair market, reported that it repaired 197 vessels during a recent 12- month period. Northwest Marine Iron Works is currently overhauling the U.S. Navy amphibious assault ship USS Okinawa (LPH-3) under a more than $15-million contract. Cascade General, which purchased the assets of liquidated Dillingham Ship Repair Company in 1987, recently completed an approximately $2.5-million overhaul of the U.S. Coast Guard icebreaker Polar Star. Business Base Expanded During 1988, PSRY expanded its business beyond traditional ship repair. Examples of this include layberthing (berthing and mooring ships for long periods of time) and conversion of Ready Reserve Force ships and layberthing large oil tankers that are in between charter assignments. Portland's location, excellent mooring facilities, and the harbor's salt-free fresh water are assets that have attracted shipowners. Another successful diversification effort has been the fabrication of oil field modules—high job-generating projects PSRY has done continuously since 1984. A $12-million ARCO Alaska 1989 Sealift module project was recently awarded to Portland. The contract was awarded to Wright Schuchart Harbor Company of Seattle. The company will build five 1,500-ton modules, roughly the height of 11- story buildings. In addition to PSRY's 24-acre module fabrication site adjacent to the shipyard, to support future work, an additional 30 acres in the Swan Island lagoon are being filled and developed for oil module fabrication projects. Yard Rehabilitation Nears Completion A major rehabilitation of the older portion of PSRY that dates back to Henry J. Kaiser World War II shipbuilding is about 75 percent complete, according to Mr. Alvis. Started in 1982, the $10-million rehabilitation project is a "selfhelp" program to be paid out of shipyard revenues. The rehabilitated facilities support the Port's Drydocks 1 and 3. The older part of PSRY was not included in the major PSRY $84- million ship-repair expansion program approved by Portland voters in 1976. That program provided Drydock 4, one of the largest of its kind on the West Coast, and its various support facilities and services which became operational in 1979. "This rehabilitation is a joint effort of the Port (of Portland) and our ship-repair contractors to extend the useful life of the older part of the shipyard from our own revenues, without asking for additional tax," Mr. Alvis said. He explained that four of the eight Washington cranes dating from World War II, manufactured in 1942, have been restored to like new condition. "Even though these cranes have given the Port 40 years of service, after total reconditioning, they are now new pieces of machinery with an expected service life of 20 years or more," he added. In addition to reconditioning the cranes, the PSRY rehabilitation is making new ship berths out of old ones—with replacement of piling, decks, pavement, new lighting, new and improved utilities and sewer mains, river water systems and sprinkler improvements, new and vastly improved electrical substations, and a compressed air distribution system and enlarged equipment lay-down areas.